The Roma self-government: how Roma can help themselves out? — Правозахисний фонд "Розвиток" | www.rozvitok.org The Roma Self-Government: How Roma can Help Themselves out? The Roma Self-Government: How Roma can Help Themselves out? The well known saying “Help yourself out” or even tougher “People in trouble are left to themselves” may seem cynical but are still fair enough. Much as it sounded hackneyed, the person should not wait for their fairy godmother to help them to improve their life. Furthermore, the experience shows that the things taken for granted are often not appreciated. That is why as numerous statistic data show, the best results are achieved when people get self-organized into groups to solve their issues together. Besides it often happens that the sponsors’ gifts are not needed and are even abusing. The community knows best what she needs for its development. Have a problem – have a quick solution/result. The brightest example of this kind may be the Apartment building co-owners association. The similar forms of the self-government are getting more and more popular in Ukrainian cities, as well as in Transcarpathian ones. The main goal of the Apartment building co-owners association is to solve issues by one`s own and not to expect the governmental housing and communal services to take care of their house. Guided by the Apartment building co-owners association experience, but firstly by the Regulations about the bodies of the self-government the Roma community activists and the Charitable fund “Progress” initiated creation of the Roma community self-government body in Mukacheve for the first time in Ukraine. Together with “Mukachevo Human Rights Center” the Roma community in Mukacheve developed its Regulations about the Roma self-government body. The final argument for creating of this body was a clear ignorance of the problem of the absence of the water supply in the Roma camp by the Mukacheve local authorities. Furthermore, according to the city council representatives the problem is yours only and you are the ones to solve it. The Roma community is ready to do anything, on legal grounds only. The right to create the self-government bodies is guaranteed by the Constitution of Ukraine (article 140). The self-government bodies are the representative bodies created by dwellers that live on the territory of the village, settlement, city or their parts on the legal basis for solving tasks that are foreseen by the Law of Ukraine “About the self-government bodies”. The self-government bodies are the house, street, quarter committees, committees of the micro districts, committees of the districts in cities, village and settlement committees. In general the self-government bodies are divided into three types. The Roma self-government body falls within the third one: the self-government bodies that are created by the part of the place dwellers – house, street, quarter committees (individual buildings), and committees of the micro districts. 3) participation in realization of the social and economical, cultural development of the relevant territory, other local programs. The self-government bodies are created on the grounds of territory. The territory of the body can be a part of a place where the initiators of the self-government body live. The permit for creation should be given by the local self-government body of the relevant territory. In general, the order of creation of the self-government bodies, separation of powers with the local self-government bodies, functions of the leaders and members, financing, probable breaches of organization and other rules are clearly explained, determined. That allows creation of their own Regulations without need of inventing something, just following the scheme. Getting ahead, we want to highlight the fact, that while creating the Regulations about the Roma self-government body we used the same scheme. Of course, we can sum up the results of the Ukrainian self-government bodies for the period of their existence. There are few ones who would disagree, that civil initiative and striving to solve the own problems on one`s own is a good thing. But there were also some negative things. A few years ago there were a note of the Department of the civil society development strategies prepared, that described the experience of cooperation between self-government bodies, local authorities and business and the problems that had arisen. Namely, it reads, that the Ukrainian self-government bodies really develop, grow and widen their activity spheres in the local self-government system and develop new cooperation opportunities with the local authorities. Apart from working on the traditional ones, such as improving of the living services, territories and informing citizens about the activities of the local authorities, the self-government bodies have been getting more and more involved into the planning of development of the territorial community. As a result of the self-government bodies activity the suggestions of the citizens got included into the programs of economic and social city development; the self-government bodies’ members took part in developing Statutes and other local normative legal documents. The note`s authors emphasize the fact, that cooperation with the self-government bodies does good for the local authorities. Engaging the self-government bodies as performers of the social projects, the councils solve the issues of invalid people social protection, struggle against homelessness, children`s homelessness and dereliction, the essential social diseases prevention more efficient. In general, the city councils have started to understand the advantages of sharing powers with the self-government bodies. In different Ukrainian cities the city councils have shared the powers in drawing up reports on administrative crimes, agreement-based fundraising for building, widening, renovation and maintenance of the social infrastructure objects, environmental protection actions with the self-government bodies. The self-government bodies work out different programs for improvement of the territories, renovations, communications on their own and the city councils willingly give money for that as this issues will not bother them anymore. But still there are certain problems. In lots of cities the dwellers are not ready to be initiative and to self-organize, because they think they cannot influence the authorities. In the authors` opinion, the main problems in relationship between the self-government bodies and local authorities are the incapability or unwillingness of the representatives of the territorial communities to acknowledge the role of the self-government bodies in the system of the local self-government. In lots of cities the councils are not ready for the partnership with the representatives of the territorial communities. At the same time, challenges in the cooperation between the self-government bodies and authorities are just the growth problems that can be fully solved by means of the wise organization. On conditions of their social partnership when working on political decisions concerning social and economic development of the territorial community the self-government bodies will be able to fulfill their potential as the most efficient mechanism of the social activization of the citizens. Concerning the Roma self-government body: the Regulations have been worked out by the Charitable fund “Progress” together with the representatives of the Roma community. Participation of the local self-government body is very important in this case: it is clear, that without interest and real participation of the local authorities it is extremely hard or even impossible to implement such a project. 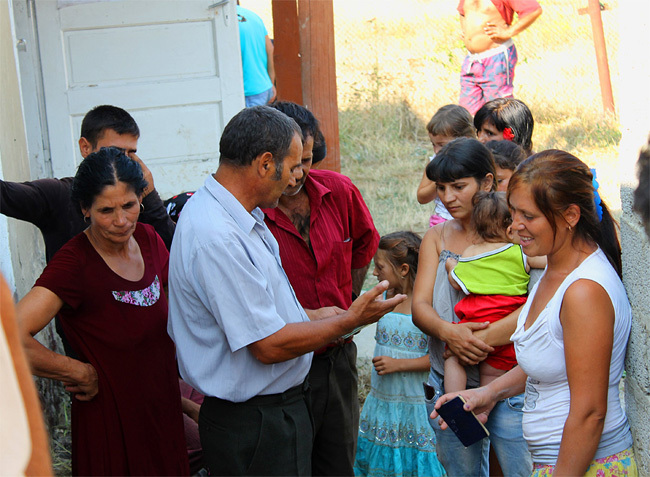 It is highlighted in the Regulations, that the Roma self-government body is an integral part of the local self-government in the Mukacheve city and is created for solving certain local issues. That means that the self-government body is a full-grown unit of the local authorities with its own direction. Besides the Roma self-government body is independent in its activity and has no superior bodies or organizations. –	providing efficient defense from the criminal activity, breaches of low, any forms of violence and discrimination. All the dwellers of the territory where the body is created have right to be chosen as members of the self-government body. Any limitations for dwellers concerning the work at the organization are inadmissible. Apart from that, the property rights for the land and the relevant duties are described in the Regulations. For example, it is mentioned that each dweller of the Roma settlement has a property right for land and a right to lease land in order to practice entrepreneurial and other activity. Of course, the consequences of the breach of land obligations are mentioned too. It is very important to clarify the Roma land issues, because the unauthorized building and the absence of registration as a result are thorny issues in the Roma community. Apart from that, the Regulations about the Roma self-government body describes the material basis of the body activity, communal order for the Roma community territory, rights and duties of the Roma dwellers (it is especially emphasized, that the Regulations commit the Roma people to keep rights and freedoms of other dwellers), the forms of the Roma community rights implementation in the local self-government, symbols and territory, on which the Roma self-government body acts. The section “The powers of the Roma self-government bodies” explains the tasks of the body. It means: representation of the interests of the micro district dwellers at the city council and its executive bodies, as well as at the District governmental administration and the governmental authority bodies. Also it will take part in the creation and submitting of the suggestions to the projects of the local programs for social, economic and cultural development in an established order, organize the participation of the dwellers in the different actions on a voluntary basis, control the quality of the housing services, renovations; help the educational, sporting, cultural institutions. The cooperation with the law-enforcement agencies, reception and processing of the citizens appeals, account of the district dwellers, representation in the court by order of the certain dwellers of the micro district and so on. It is important, that the local and governmental authorities have no right to get involved into the Roma self-government body activity, unless it was foreseen by the legislation of Ukraine. Apart from that, the self-government body can dispute the decisions and actions of the authorities, enterprises, institutions if, in its opinion, they breached the Roma self-government body interests. Concerning the responsibility of the very members of the self-government body: their decisions, activity or inactivity can be disputed in the city council or in court. Besides, the activity of the Roma self-government body can be stopped because of the illegal actions. As we can see, the Regulations about the bodies of the self-government have been carefully worked out. Nevertheless, this is not necessarily the final version; it can be easily supplemented or changed. We highlight the creation of the Roma self-government body, because we think, that such bodies will help the Roma community to solve their thorny problems more quickly and efficient, and, finally, will essentially contribute to integration of the Roma community into Ukrainian society. The legislative basis helps to clearly imagine the Roma self-government body opportunities, be sure, that it will not break the law and give a more or less clear prognosis of the concrete actions of the body for the sake of its community. The self-government is significant, because it conveys the will of the territory dwellers. The interests of the dwellers, who think about their future, want to rule the territory development and have no fear of responsibility become more important. The Roma self-government bodies are an important element of the local self-government system. They let the representatives of the Roma national minority to take part in solving of the local issues and implement the powers, gained from the local council. From this viewpoint, they are a kind of authorities, because they have something in common with the local self-government bodies and other public authorities. At the same time, they are going to work on the civil basis, are likely to be situated on the micro district territory, where the Roma self-government body is created, so they are going to be closer to the community. In general, it will resemble a civil organization. In our opinion, the creation of the Roma self-government bodies will really become a serious step in this direction. When the initiative Roma community representatives will take part in improvement of their living conditions, they are going to realize, that it is possible to change something on their own. And their example will be useful for the less initiative micro district dwellers. P.S. Project “Holding an advocacy campaign for supporting the Roma self-government development in the Transcarpathian region” is implemented by the Charitable fund “Progress” with the assistance of the European Commission and The Eastern Partnership Minorities Network .